Bring all your golfing friends and family to Tar Heel 1 for a magnificent Myrtle Beach golf package. 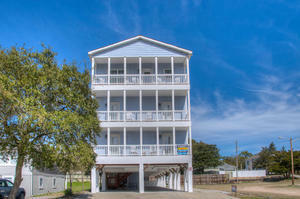 Tar Heel 1 is a third-row beach vacation house, and an excellent choice for your Myrtle Beach golf package accomodation. The 8-bedroom golf vacation beach house has seven baths and up to 16 people can nicely sleep in the eight private bedrooms. This beach house option is quite a Myrtle Beach golf vacation catch because of its central location and long list of amenities. Nestled in Ocean Drive, Tar Heel 1 is a short walk to the beautiful beaches. Featuring a sparkling blue swimming shared pool, Tar Heel 1 has more in store for your golfing group than you can imagine. Take a dip in the privacy of your own yard at this North Myrtle Beach beach house or walk to the Atlantic Ocean where the crashing waves will wash away all your stress. Tar Heel 1 is an incredible Myrtle Beach golf package vacation destination. Designed with a fully-furnished kitchen, Tar Heel 1 includes such appliances as a microwave, dishwasher and refrigerator. 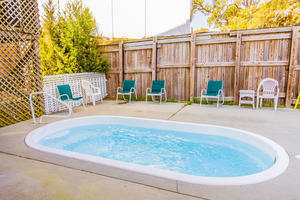 There is even a washing machine and clothes dryer in this spectacular Myrtle Beach golf vacation rental. Bring your favorite movies because Tar Heel 1 boasts numerous DVD players and televisions. Your entire golf group will love spending time at Tar Heel 1 where a game room offers recreational options for everyone. Step outside onto Tar Heel 1's private balcony where you can feel the sea breezes, smell the salt air and glimpse the Atlantic Ocean. This is a treasured vantage point you will likely relish for the duration of your Myrtle Beach golf package. All the conveniences you need are at Tar Heel 1, including an elevator that helps people of all ages and abilities reach every level of the beach house. Fun amusements and exciting attractions are only minutes away from Tar Heel 1. Live theatre entertainment, outlet malls, Sea Doo rentals, parasail rides, water parks, miniature golf and more are just around the corner. Myrtle Beach is famous for its golf courses, and any of the 100 that you add to your Myrtle Beach golf package are all close to this fantastic beach house. Delicious, fresh seafood is everywhere. Make Tar Heel 1 your Myrtle Beach golf vacation headquarters and reserve these spacious accommodations today.